How two figures interact is not something I usually need to think about. But I have set myself a challenge. To capture the spirit of the Cracker Packers, there has to be two figures. And they have to be engaged in story-telling and happy chatter. I want the women to be dynamic, not passive, just as the Cracker Packers are in real life – full of life. Many sculptors would shy away from this but I think it’s important to give it a go. It starts by working with the Cracker Packers in the workshop back in April 2017 (see the short film), getting them to act out the stories of the Cracker Packers’ time at Carr’s/McVitie’s. 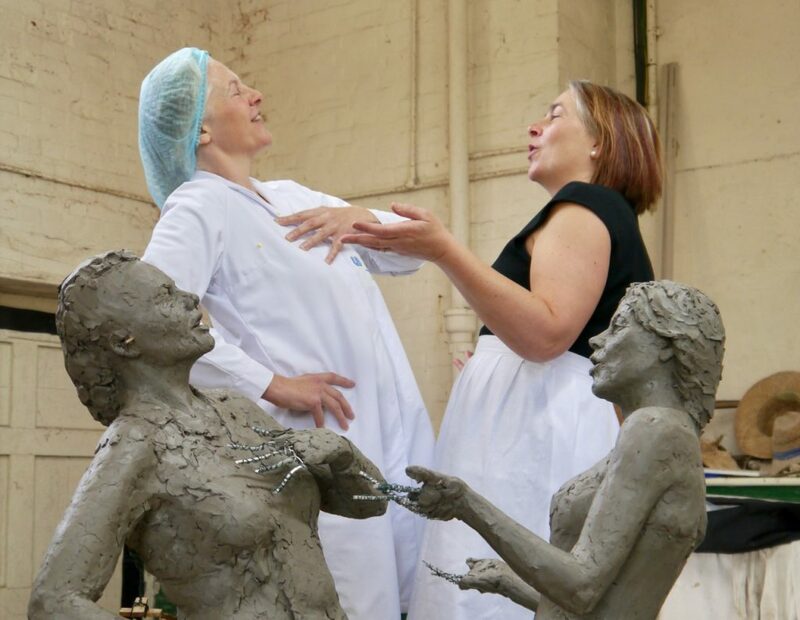 Afterwards, getting Sandra and Jenni into the studio together helps to work up the ideas from the workshop and to test out how the two figures would best be interacting. The final site for the statue in Caldewgate, Carlisle, is a busy transport hub, with people seeing the statue from all directions – whether they are sitting on the nearby bench, walking by, queuing at the traffic lights, or waiting for the bus. Everyone deserves an interesting view of these two Cracker Packers engaging across time – between the early 1900s and the present day. From the very start of the build of the maquette, I need to bring the two small sculptures together to see how they are interacting. And during all the following stages – from the armature to the finished clay figures – it is necessary to bring the two figures together. I invest in two hydraulic lifting tables on wheels so that I can work on the figures separately and then wheel them together to assess the engagement between them. A couple of times I bring in Sandra and Jenni to finely tune the figures’ interaction; checking that the bodies are connecting and the eyes are inline. Even at the very final stages at the foundry – during the wax working and the metal working – I make minor tweaks. I offset the two figures a little more, to enhance the views from the different directions and improve the ‘eye contact’ of the Cracker Packers.